Bioeconomy Day fosters more public-private partnerships to spur economic growth in Sabah. 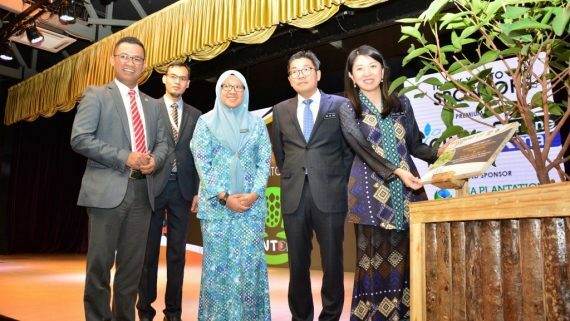 Kota Kinabalu, 11 November 2015 – Strengthening closer cooperation among all stakeholders in the bio-based industry is key to boosting Sabah’s economy while improving productivity, welfare and prosperity of its citizens, officials and experts said during the Bioeconomy Day in Kota Kinabalu. Following the launch of Bioeconomy Day in Kuala Lumpur during the BioMalaysia & ASEAN Bioeconomy Conference & Exhibition on 17 August 2015, the event was organised by Malaysian Biotechnology Corporation (BiotechCorp) to highlight the current achievements of the Bioeconomy Transformation Programme (BTP) and Bioeconomy Community Development Programme (BCDP) while providing awareness about these programmes and their opportunities for Sabah’s communities and private sectors in the bio-based industries. The ceremony was officiated by the Minister of Science, Technology, & Innovation (MOSTI), Datuk Seri Panglima Madius Tangau, who announced several high impact BTP projects in Sabah. These projects include the Development of Fully Integrated Aquaculture Facilities by Sunlight Inno Seafood Sdn Bhd, Integrated Bio-Refinery Complex in Palm Oil Industrial Cluster by Genting Plantations Berhad, Expansion of Shiitake Mushroom Production Facility by Korporasi Pembangunan Desa (KPD) via Agrodesa Sdn Bhd, and the Biogas Power Generation Plant at Kapilit Palm Oil Mill by Sabah Softwoods Berhad (SSB). “Collectively, these projects are expected to contribute RM858.4 million of GNI in 2020, RM2.73 billion in investments and 4,636 jobs by the year 2020,” he said. “As of October 2015, the BTP boasts a total of 48 Trigger Projects which are expected to generate a total GNI of RM5.97 billion in 2020, provide 25,355 jobs opportunities and secure cumulative investments of RM18.21 billion by 2020. I hope to see more support coming from inter-ministries and more collaborations established among industry players to capitalise on the vast opportunities in Sabah’s bio-based industries.” Chief Executive Officer of BiotechCorp, Dato’ Dr Mohd Nazlee Kamal said that BTP and BCDP will greatly impact and benefit Sabah by leveraging on the state’s natural resources and strategic location to expand high potential economic activities in the bio-based sector subsequently contributing to the rakyat’s wealth creation. “The BCDP programme has been formally recognised as part of the National Blue Ocean Strategy (NBOS) initiatives, which aims to provide job opportunities from 2016 to 2020 of more than 3,500 farmers with minimum additional income of RM4,500 per month impacting more than 17,000 lives in the rural communities,” he shared. “Moving forward, establishing a road map would ensure that bioeconomy-related initiatives succeed in its contribution to transform Sabah and Malaysia into a high-income economy. In order for bioeconomy to grow in Sabah, there is a need to foster public-private interactions in developing and exploring high-impact opportunities in the bio-based industries for Sabah.” Attendees ranging from ministry agencies, bioeconomy stakeholders, industry players and researchers participated in presentations on BTP as well as BCDP and joined a workshop to discuss and share bio-based commercial opportunities or projects that could potentially be incorporated into BTP and/or BCDP. The Bioeconomy Day is expected to encourage more collaborations and participation in BTP and BCDP as well as to realise the programmes’ goal of making the bio-based sector as an engine of economic growth for Sabah.